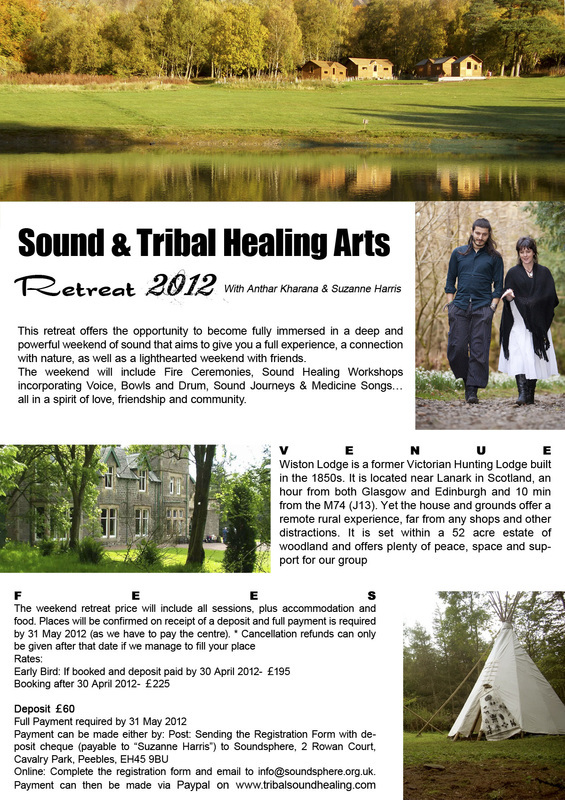 SOUND & TRIBAL HEALING ARTS 2013 RETREAT! After our success in 2012, we return with another wonderful opportunity to continue sharing the wonders of sound in 2013! 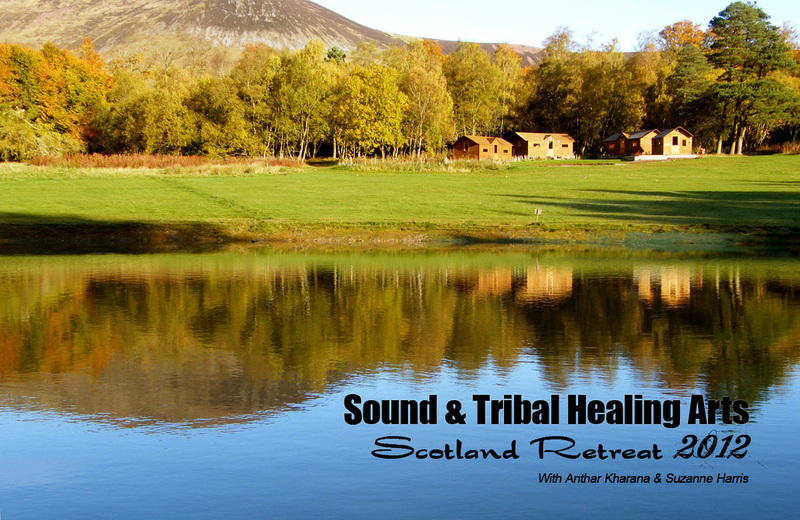 This retreat offers the opportunity to become fully immersed in a deep and powerful weekend of sound and tribal healing arts that aims to give you a full experience, a connection with nature, as well as a lighthearted weekend with friends. The weekend will include an Opening Fire Ceremony, Sound Healing Workshops incorporating Voice, Bowls and Drum, Sound Journeys and Medicine Songs…all in a spirit of love, friendship and community. The weekend will be hosted by Anthar Kharana of Tribal Healing Sounds and Suzanne Harris of Soundsphere. Anthar and Suzanne have been working together since 2007 sharing their soundwork and music with people all over the country. The venue for the weekend will be Wiston Lodge, a former Victorian Hunting Lodge built in the 1850s. It is located near Lanark in Scotland, an hour from both Glasgow and Edinburgh and 10 minutes from the M74 (J13). The house and grounds offer a remote rural experience, far from any shops and other distractions. It is set within a 52 acre estate of woodland and offers plenty of peace, space and support for our group. Our group will be staying in the wonderful new timber log cabins overlooking the pond. The cabins are warm and comfortable and are constructed in Scotland from locally sourced timber. There are three bunkhouse cabins, each with two bedrooms, WC and shower, catering for 6 people each. All bedding is provided. A fourth communal cabin houses a small kitchen, seating and games. * If the cabins become full, there is also the possibility of CAMPING next to the cabins and further information on this can be provided nearer the time. All meals will be provided throughout the retreat, from an evening meal on the Friday evening, to lunch on the Sunday. Breakfast and lunch will be provided as a buffet style in the communal cabin, and dinner on Friday and Saturday will be provided in the main house. The menu will be vegetarian. The weekend retreat price will include all sessions, plus accommodation and food. Your place will be confirmed on receipt of the deposit. Friday 8pm : Opening Fire ceremony. A chance for us all to gather around the fire and share a ceremony to support all the work we will be doing over the weekend. Saturday: A wonderful full day of sonic experiences! Working with sound in deep and powerful ways, you will experience sound and sounding, movement, breathwork, nature, different instruments and learn medicine songs. Sunday:	Developing from the work on day 1, we will take the sounds out into nature to enhance and deepen our connection.